Andhra Pradesh's Chandrababu Naidu has emerged as the wealthiest chief minister with declared assets worth over Rs 177 crore, followed by Arunachal Pradesh's Pema Khandu (over Rs 129 crore) and Amarinder Singh of Punjab (over Rs 48 crore). IMAGE: Andhra Pradesh Chief Minister N Chandrababu Naidu. 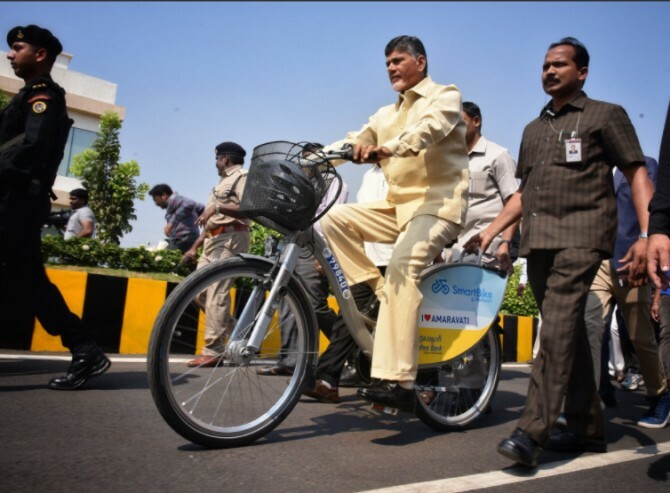 Photograph: Courtesy, N Chandrababu Naidu's Twitter account. Around 35 per cent chief ministers in India have criminal cases against them and 81 per cent of the total are crorepatis, according to an ADR report. The Association for Democratic Reforms (ADR) and National Election Watch (NEW) have analysed the self-sworn affidavits of current chief ministers (CMs) in state assemblies and Union territories across the nation. These were the latest affidavits filed by them prior to contesting the elections. "Out of the all 31 chief ministers analysed from state assemblies and Union territories, 11 (35 per cent) chief ministers have declared criminal cases against themselves," the ADR report noted. 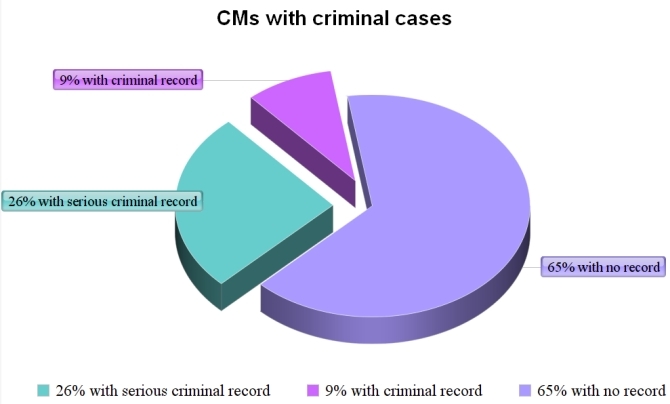 Further, 26 per cent CMs have declared serious criminal cases, including related to murder, attempt to murder, cheating and dishonestly inducing delivery of property, criminal intimidation, among others. 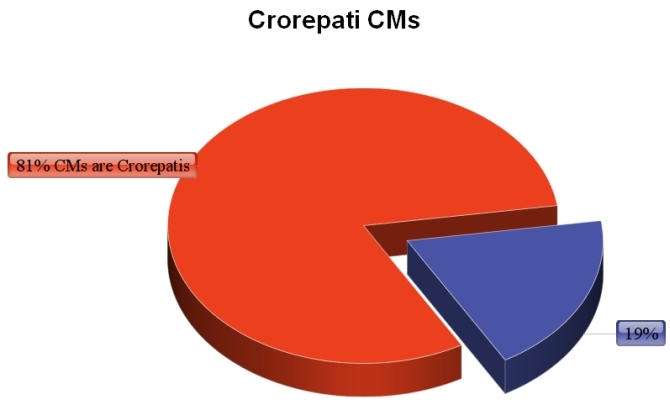 Interestingly, as many as 25 CMs, or 81 per cent, are crorepatis, with two of them having assets to the tune of over Rs 100 crore. The average assets of CMs are worth Rs 16.18 crore. According to the report, Andhra Pradesh's Chandrababu Naidu has emerged as the wealthiest chief minister with declared assets worth over Rs 177 crore, followed by Arunachal Pradesh's Pema Khandu (over Rs 129 crore) and Amarinder Singh of Punjab (over Rs 48 crore). The CM with the lowest declared asset is Tripura's Manik Sarkar with assets worth Rs 27 lakh, followed by West Bengal's Mamata Banerjee (over Rs 30 lakh) and Jammu and Kashmir's Mehbooba Mufti (Rs 56 lakh). 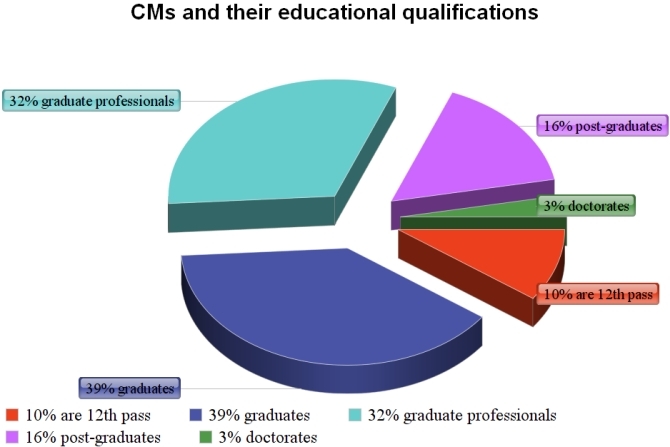 In terms of educational qualifications, 10 per cent among the 31 chief ministers are 12th pass, 39 per cent graduates, 32 per cent graduate professionals, 16 per cent post-graduates and 3 per cent doctorates. Does Modi rule out war?